Ruth Thompson, a longtime lawyer and judge, became the first woman to represent Michigan in Congress and the first to serve on the House Judiciary Committee. Her legislative interests were eclectic, ranging from a proposal to create a Department of Peace to the establishment of a congressional Page academy. Representative Thompson’s career ended abruptly following a contentious fight over the development of a jet fighter base in her northwestern Michigan district. Ruth Thompson was the first child born to Thomas and Bertha Thompson in Whitehall, Michigan, on September 15, 1887. She attended public schools and graduated from the Muskegon Business College in Muskegon, Michigan, in 1905. Beginning in 1918, she worked in a law office and studied law in night school for six years before she was admitted to the bar in 1924, becoming the first female lawyer in Muskegon County. She also served as the registrar of the county’s probate court for 18 years. Thompson was elected judge of probate in Muskegon County in 1925, a position she held for 12 years. In 1938 she won election to a term in the Michigan state house of representatives as the state’s first woman legislator. From 1941 to 1942, Thompson worked for the Social Security Board’s Old Age and Survivor’s Insurance Division in Washington, D.C. She then worked for three years in the Labor Department’s Wage and Hour Division. In 1945, Thompson went to Headquarters Command of U.S. occupation forces in Frankfurt, Germany, and Copenhagen, Denmark, where she worked on the adjutant general’s staff. A year later, she returned to private law practice in Michigan. When she took her seat in the 82nd Congress (1951– 1953) in January 1951, Thompson won a coveted spot on the House Judiciary Committee, becoming the first woman to serve on that panel. There was initial resistance to her appointment, but her work as a judge and as chair of the Michigan prison commission for women, from 1946 to 1950, helped override objections. Admired by colleagues for her work ethic, she remained on the Judiciary Committee throughout her House career, serving as a member of the subcommittees on Bankruptcy and Immigration and Naturalization. In the 84th Congress (1955–1957), Thompson also was appointed to the Joint Committee on Immigration and Nationality Policy. Thompson’s congressional career began to unravel when the Air Force announced that it planned to build a new fighter–interceptor base outside her district, despite her private and public protest that Defense Department officials had originally promised her repeatedly that the base would be located inside her northwestern Michigan district. Thompson also revealed that she had been offered a $1,000 campaign bribe to agree to have the base built in Cadillac, Michigan, outside her congressional district. She had informed Harold E. Talbott, the Secretary of the Air Force, of the bribe and was assured that Cadillac would not be chosen under any circumstances. When that city was named in favor of two others, Thompson protested vigorously to Carl Vinson of Georgia, chairman of the House Armed Services Committee. Vinson sided with the Congresswoman, and the base was eventually built in Manistee, inside her district.10 But the political fallout resulting from the delay and additional construction costs, which totaled $5 million, created resentment among Thompson’s constituents. In August 1955 local Democratic leaders drew up a recall petition against Thompson, charging that she was “jeopardizing the safety of the nation by prolonging the jet base decision.”11 Though the recall drive failed, it demonstrated just how much the episode had roiled the district. In the August 1956 GOP primary, the 70–year–old Thompson lost narrowly to Robert P. Griffin (who won the general election and later went on to serve in the U.S. Senate). After Congress, Thompson returned to Whitehall, Michigan. She died on April 5, 1970, in Allegan County, Michigan. 1Hope Chamberlin, A Minority of Members: Women in the U.S. Congress (New York: Praeger, 1973): 222–225. 2“Michigan Unions Clash in Primary,” 18 July 1954, New York Times: 37; “Election Statistics, 1920 to Present,” “Elections Statistics, 1920 to Present,” http://clerk.house.gov/member_info/electionInfo/index.aspx. 3Karen Foerstel, Biographical Dictionary of Congressional Women (Westport, CT: Greenwood Press, 1999): 268–270; Congressional Record, House, 82nd Cong., 1st sess. (15 March 1951): 2502; “A Problem for the Housewife,” 16 March 1951, New York Times: 12. 4Congressional Record, House, 83rd Cong., 2nd sess. (13 July 1954): 10452. 5“Rep. Thompson: Proposes Academy for Pages,” 16 February 1954, Washington Post: 24; “Senate, House Pages Take Dim View of Proposed Academy for Them,” 23 February 1954, Washington Post: 17; Congressional Record, House, 83rd Cong., 2nd sess. (16 February 1954): 1850; Donald Bacon et al., The Encyclopedia of the United States Congress, Vol. 3 (New York: Simon and Schuster, 1995): 1517–1518. 6The first girl Page entered service in 1971; the first female House Page was admitted in 1973. Congressionally operated Page dorms were opened in the 1980s. 7Congressional Record, House, 82nd Cong., 1st sess. (27 July 1951): 9096; Congressional Record, House, 83rd Cong., 1st sess. (30 March 1953): 2505. 8Congressional Record, House, 83rd Cong., 1st sess. (20 July 1953): 9288. 9Congressional Record, House, 82nd Cong., 2nd sess. (23 April 1952): 4308. 10For Thompson’s explanation of this tortuous process, see Congressional Record, House, 84th Cong., 2nd sess. (12 April 1956): 6251–6253. 11“Recall Move Prompted by Jet Base Row,” 2 August 1955, Washington Post: 8. Papers: 1887-1999, 2 cubic feet. This collection of archival materials includes letters, awards, certificates, notebooks, speeches, legislative acts, scrapbooks, nominations, and photo graphs that provide valuable information about the life and career of Judge Ruth Thompson. The majority of the materials in this collection are from when Judge Thompson traveled abroad during World War II to her last year as a congresswoman in 1956. A finding aid is available in the repository and online. Papers: In the Pluma Burroughs Penton Batten Papers, ca. 1948-1964, 5.25 linear feet. Subjects include Ruth Thompson. An unpublished finding aid is available in the library. Papers: ca. 1950-1957, 0.3 linear foot and 1 oversize volume. The papers include a scrapbook containing news clippings, greeting cards and telegrams, correspondence, programs and scattered photographs; and miscellaneous loose scrapbook materials and photographs. Papers: In the Owen J. Cleary Papers, 1944-1959, 10 linear feet and 2 volumes. Correspondents include Ruth Thompson. A finding aid is available in the library and online. Papers: In the Albert Joseph Engel Papers, 1885-1960, 10 linear feet. Correspondents include Ruth Thompson. A finding aid is available in the library. 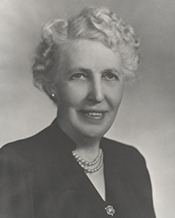 "Ruth Thompson" in Women in Congress, 1917-2006. Prepared under the direction of the Committee on House Administration by the Office of History & Preservation, U.S. House of Representatives. Washington: Government Printing Office, 2006.